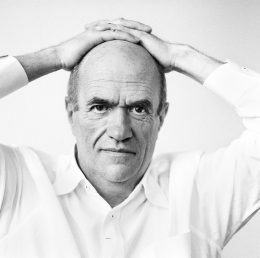 Irish novelist and journalist Colm Tóibín, recipient of the Dayton Literary Peace Prize’s 2017 Holbrooke Distinguished Achievement Award, will take part in a panel discussion at Wright State University. The event, titled “Classical Tragedy and the Modern Imagination: A Conversation with Colm Tóibín,” will be held Monday, Nov. 6, from 2 to 3 p.m. in the Stein Galleries, 160 Creative Arts Center. It is free and open to the campus community and the public. Tóibín was born in Ireland in 1955, graduated from University College Dublin and later became editor of Magill, Ireland’s main current affairs magazine. Three of his novels have been short-listed for the Man Booker Prize — “The Blackwater Lightship” (1999), “The Master” (2004) and “The Testament of Mary” (2012). “The Master” also won the LA Times Novel of the Year, and the stage version of “The Testament of Mary” was nominated for a Tony Award for Best Play. Tóibín is the Irene and Sidney B. Silverman Professor of the Humanities at Columbia University, a contributing editor at the London Review of Books and chancellor of the University of Liverpool. The panel discussion at Wright State is expected to focus on the use of classical tragedy in “House of Names,” the Tóibín novel that retells the story of Clytemnestra and her children in ancient Mycenae. Carol Loranger, chair of the Department of English Language and Literature, said Tóibín’s stories often trace the breaking and reassembling of families, including those of history and mythology. Inaugurated in 2006, the Dayton Literary Peace Prize is the only annual U.S. literary award recognizing the power of the written word to promote peace. It honors adult fiction and nonfiction books that lead readers to a better understanding of other cultures, peoples, religions and political points of view. Wright State has been heavily involved with the peace prize. The Department of English Language and Literatures is a supporter, helping plan events surrounding the annual awarding of the prizes and sponsoring authors who come to campus to meet with creative writing students and give public readings. The panel discussion is also supported by the Wright State Departments of Classics, Art and Art History, and History as part of their humanities collaborative initiative, as well as by the university Peace Lecture Committee. Wright State celebrates its 50th anniversary as an independent public university in 2017.